Today I’m going to lift the lid on what a mantra meditation is and how to it works. I’ve been using mantra meditation for over 15 years and it’s the one I defer to most of the time. I found that it’s been one of the most powerful tools for helping me to get out of my head and into a place of peace. 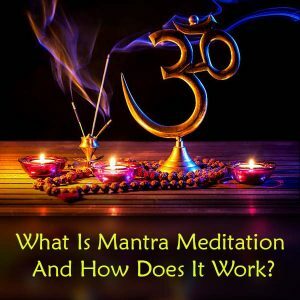 Mantra meditation has been used for thousands of years for all sorts of reasons ranging from focusing the mind through to spiritual awakening. In ancient times, sacred mantra’s were passed down from teacher to student that would help them to attain a state of enlightenment. These days, mantra’s have evolved to include simple phrases that can be focused on to help quiet the mind and uplift your energy levels. In other words, they give your brain something to pay attention to that isn’t stressing you out or draining you. Here are just a few of the many benefits of daily mantra meditation. Just the simple act of repeating a phrase over and over again in your head enables your brainwaves to start to slow down. When this happens, then the mind naturally starts to quiet down. You can’t make the mind shut up as that just makes it want to fight back. But by giving it something to do that is focused on the present, it can happily stay busy until it clears. depending on what the mantra is that you are using it can be a very effective way to uplift your mood. Mantras work because they are basically a word or phrase that converts to sound in your brain. As long as they are words or phrases that convert to upbeat sounds then your vibe can be instantly elevated. With the brain being bombarded with so much noise and stimuli from moment to moment it’s not a wonder your stress levels are constantly on high alert. Focusing on a mantra creates space in your head because it draws the mind into it so that it can reduce the noise of everything else that’s been going on. Here are some really simple mantras to get you started. You can practice this for anything from 30 seconds to 30 minutes. “I am that I am. These, of course, are more of the modern-day mantras that you can use while walking, standing in a queue, sitting at your desk, or even driving your car. You can even make up your own if you like. The next time you feel like you need more space in your head, have a go at using mantra meditation as your mindfulness practice. 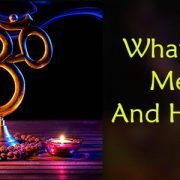 https://www.meditationdojo.com/wp-content/uploads/2017/06/what-is-mantra-featured-image.jpg 300 800 Michael Atma http://www.meditationdojo.com/wp-content/uploads/2017/01/Meditation-Dojo-2017-5-300x77.png Michael Atma2017-06-23 05:10:502017-06-23 05:10:50What Is Mantra Meditation And How Does It Work?